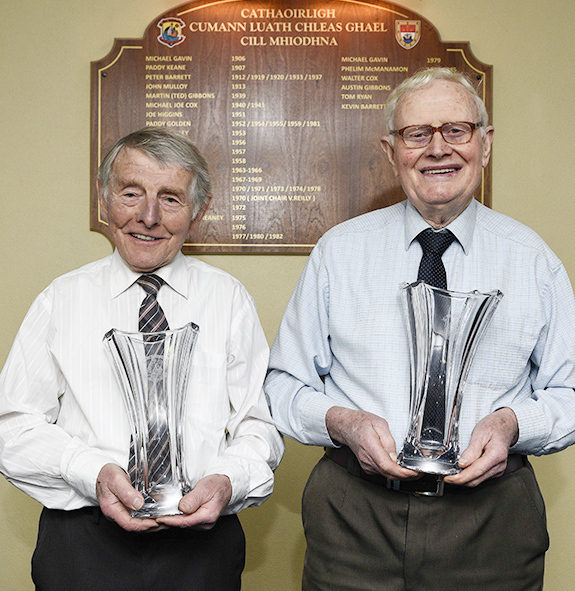 Mr. John Moran and Mr. Paddy O’Grady were, recently, the recipients of a presentation by the Club Chairman in recognition of their commitment, dedication and loyalty to Kilmeena G.A.A.. Both men have been involved with the Club since the 1950’s and are still familiar faces at all the matches. John and Paddy have been exemplary Club Officers and, in more recent years, Club members. They both held the role of secretary, intermittently, during the formative years of the Club when it was very difficult to encourage participation or render an effective promotion. While John emigrated to London in 1957, Paddy and his colleagues continued the battle to keep Kilmeena G.A.A. tenable. Paddy led by example and agreed to accept the position of Chairman from 1963- 1966.He was also the West Board delegate and a Junior team selector. John’s years in England did not quell his appetite for gaelic football and he spent many years in Parnells Gaelic Club in London where he found solace with the other Irish emigrants who were also determined to promote our national game amongst the Irish fraternity. John still receives the London “ Irish Post” for the specific purpose of the football update on the Irish Clubs. 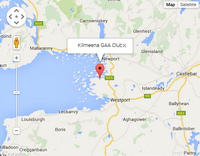 On his return to Kilmeena during the 1970’s John instinctively re -joined Kilmeena G.A.A. and became a trainer with the Junior team. Although this team reached the West Final in 1973 and the West semi- finals in 1974 and 1975, the ultimate victory belonged to the opposition on each occasion. Regardless of the transformation in attitudes and techniques to the game of gaelic football or the influence of other sports, both of these men have never relented from their aspiration to promote the G.A.A within the parish and build a Club that would withstand the test of time. Throughout the years they have witnessed the exhilaration of victory and the disappointment of defeat. They have extended the hand of friendship to numerous new members and encouraged many young footballers with a discreet word of praise. Two simple gestures applied with the noble quality of their characters and an in-depth belief in the future of Kilmeena G.A.A.Club. John and Paddy were always unobtrusive in their administrative roles and in their willingness to assist with any task that was of benefit to the Club. 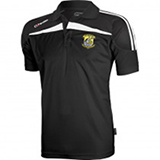 They remained the Club mainstay when emigration and apathy were dominant in the parish. They brought a dignity and finesse to their encounters with other clubs in the county They have made an endless contribution to ensure that Kilmeena G.A.A.Club will continue to develop and take pride of place in the history of this small rural parish. Congratulations Gentlemen. Kilmeena G.A.A. Club are indebted to both of you for your unfailing participation throughout six decades. You have walked in the footsteps of our forefathers who established the Club in 1889 and through your unselfishness and persistence you have expanded the parameters . History will record your names but it will still be an inadequate account of two very unassuming men with a passion for gaelic football and an unremitting loyalty to their Club.